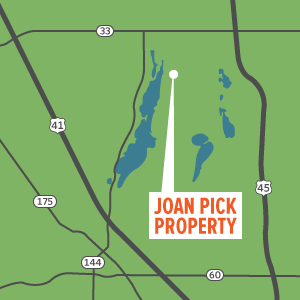 In 2013 the Cedar Lakes Conservation Foundation acquired the Pick Property, a parcel of nearly 56 acres. The property was donated in two segments, the first given to CLCF by long time supporter Ms. Joan Pick as a gift in her will when she passed away in April of 2013. Adjacent to this piece of former farmland was Ms. Picks’ residence and grounds. In Ms. Pick’s will she bequeathed her personal residence, a caretaker’s house and 17 acres to her two nieces, Loraine Budke and Andrea Sellinger. Loraine and Andrea, in turn, also gifted this property to CLCF with the intention that the organization would create a memorial to Ms. Pick and her love of nature. Part of the CLCF Statement of Purpose reads: “To facilitate serious study and research in ecology and other natural sciences as they pertain to the Cedar Lakes area.” To move forward with our natural history educational effort, CLCF responded with a vision proposal to the heirs for a potential “Joan Pick Nature Preserve” which would also house the CLCF offices. This proposal preserves the entire 56-acre Pick property, which contains a composition of uplands, forest, wetlands, grassland fields and a pond. It will take a few years and careful maintenance for the prairie to become established. As it develops there will eventually be trails to walk among these fields of native wildflowers. The prairie restoration was made possible because of a generous grant from the Melitta and Joan Pick Charitable Trust and additional financial assistance from the NRCS and the US Fish and Wildlife Service. Additionally, CLCF and the Pick Foundation had embarked on a collaboration with the Milwaukee Institute of Art and Design (MIAD) during the 2014-2015 school year as Joan Pick was a supporter of the school. This creative exercise yielded many interesting ideas and generated informative feedback. Further collaborations with design ideas and community response are planned for 2017. Visit the Pick Nature Preserve page to learn more.